Breathing (pulmonary ventilation)-the movement of air into and out of the lungs. Alveolar gas exchange-the exchange of oxygen and carbon dioxide between the air in alveoli and the blood in alveolar capillaries. Gas transport-transport of oxygen and carbon dioxide between the lungs and tissues, accomplished by the cardiovascular system. Systemic gas exchange-the exchange of oxygen and carbon dioxide between the blood in systemic capillaries and the tissue cells. Cellular respiration-the use of oxygen and production of carbon dioxide during ATP production. The structures of the respiratory system are involved directly in only two of these processes: breathing and alveolar gas exchange, which is collectively referred to as external respiration. Systemic gas exchange and cellular respiration together are referred to as internal respiration. The respiratory system does more than just exchange respiratory gases. It also helps to detect odors, produce sounds, regulate blood pH, trap and defend the body from airborne pathogens, and assist in the movement of venous blood and lymph. The respiratory system is subdivided into upper and lower respiratory tracts. The upper respiratory tract includes the nose and pharynx. The lower respiratory tract includes the larynx, trachea, bronchi, and lungs. The protruding portion of the nose is supported by bone and nasal cartilage. The nasal bones form a rigid support for the bridge of the nose, and nasal cartilage supports the remaining portions and is responsible for the flexibility of the nose. The nostrils, or nares, are the two external openings in the nose that allow air to enter and leave the nasal cavity. Stiff hairs around the nostrils tend to keep out large airborne particles and insects. The nasal cavity is the internal chamber of the nose that is surrounded by skull bones. It is separated from the oral cavity by the palate (roof of the mouth), which consists of two basic portions. The anterior hard palate is formed by the palatine processes of the maxillae and the palatine bones. The posterior soft palate is composed of skeletal muscle tissue. The nasal cavity is divided into left and right portions by the nasal septum, a vertical partition of bone and nasal cartilage that is located on the midline. Three nasal conchae project from each lateral wall and serve to increase the surface area of and create air turbulence in the nasal cavity. The superior nasal concha and superior nasal septum are lined with olfactory mucosa containing the olfactory epithelium, the tissue containing the olfactory receptors used in detecting chemicals for the sense of smell. The rest of the nasal cavity, larynx, trachea, and bronchi are covered by respiratory mucosa containing pseudostratified ciliated columnar epithelium. Goblet cells within the epithelium produce mucus to coat the epithelial surface. As air flows through the nasal cavity, it is warmed by the blood-rich mucosae and is moistened by the mucus. In addition, airborne particles, including microorganisms, are trapped in the mucus of the respiratory mucosa. Within the larynx, trachea, and bronchi, cilia of the epithelium slowly move the layer of mucus with its entrapped particles toward the pharynx, where it is swallowed. Upon reaching the stomach, most microorganisms in the mucus are destroyed by the gastric juice. Several bones surrounding the nasal cavity contain paranasal sinuses, air-filled cavities. Sinuses are located in the frontal bone, ethmoid, maxillae, and sphenoid adjacent to the nasal cavity. The sinuses lighten the skull and serve as sound-resonating chambers during speech. The sinuses open into the nasal cavity, which increases nasal cavity surface area, and are lined with ciliated mucosae that are continuous with the mucosae of the nasal cavity. The secreted mucus drains into the nasal cavity. The pharynx (fayr’-inks), commonly called the throat, is a short passageway that lies posterior to the nasal and oral cavities and extends inferiorly to the larynx and esophagus. It has a muscular wall and it is lined with mucosae containing stratified squamous epithelium. As shown in, the pharynx consists of three parts: the nasopharynx posterior to the nose; the oropharynx posterior to the mouth; and the laryngopharynx posterior to the larynx. The auditory (eustachian) tubes, which extend to the middle ear, open into the nasopharynx. Air moves in or out of the auditory tubes to equalize the air pressure on each side of the tympanic membrane. The tonsils, clumps of lymphoid tissue, occur at the openings to the pharynx. The palatine tonsils are located bilaterally at the junction of the oropharynx and the oral cavity. The pharyngeal tonsil (adenoid) is located in the superior nasopharynx, and the lingual tonsils are found on the posterior tongue. Tonsils are sites of immune reactions and may become sore and swollen when infected. Enlargement of the palatine tonsils tends to make swallowing painful and difficult. A swollen pharyngeal tonsil tends to block the flow of air between the nasal cavity and the pharynx, which promotes mouth breathing and can create snoring. When breathing through the mouth, air is not adequately warmed, filtered, and moistened. The larynx (layr ‘-inks) is a boxlike structure, composed of several cartilages, that provides a passageway for air between the pharynx and the trachea. The three largest cartilages are the thyroid cartilage, which projects anteriorly to form the Adam’s apple; the cricoid cartilage, which forms the attachment to the trachea; and the epiglottis, a cartilaginous flap that helps to keep solids (food) and liquid from entering the larynx. The larynx is supported by ligaments that extend from the hyoid bone. The vocal folds are two bands of elastic connective tissue covered by mucosa located within the larynx. They are relaxed during normal breathing, but when contracted, they vibrate to produce vocal sounds when exhaled air passes over them. The pitch (high or low tone) of a sound is determined by the vibration frequency of the vocal folds. High frequency vibrations lead to high pitch sound and vice versa. The loudness (volume) of a sound is related to the vibration amplitude of the vocal folds. The larger the amplitude the louder the volume and vice versa. The opening between the vocal folds, the glottis, leads to the trachea. The vestibular folds, which lie superior to the vocal folds, are composed of a small amount of elastic connective tissue covered by mucosa. They prevent food from entering the glottis and are not involved in sound production. Because the oropharynx and laryngopharynx are also passageways for food, a mechanism exists to prevent food from entering the larynx and to direct food into the esophagus (e-sof’-ah-gus), the flexible tube that carries food to the stomach. When swallowing, muscles lift the larynx superiorly, which causes the epiglottis to fold over and cover the opening into the larynx. This action directs food into the esophagus, whose opening is located just posterior to the larynx. Sometimes this mechanism does not work perfectly and a small amount of food or drink enters the larynx, stimulating a coughing reflex that usually expels the substance. The trachea (tra’-ke-ah), or windpipe, is a tube that extends from the larynx into the thoracic cavity, where it branches to form the right and left main bronchi. The walls of the trachea are supported by C-shaped tracheal cartilages that hold the passageway open in spite of the air pressure changes that occur during breathing. The open portion of the tracheal cartilages is oriented posteriorly against the esophagus. This orientation allows the esophagus to expand slightly as food passes down to the stomach. The internal wall of the trachea is lined with mucosa containing pseudostratified ciliated columnar epithelium, the same type of epithelium lining most of the upper respiratory tract. Mucus produced by the goblet cells coats the surface of the epithelium and traps airborne particles, including microorganisms. The beating cilia move the mucus and entrapped particles superiorly to the pharynx where they are coughed out or swallowed. Microorganisms are usually killed by gastric juice in the stomach. 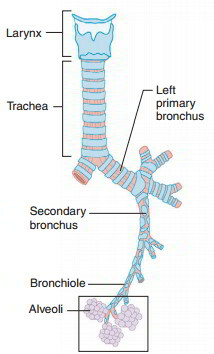 The trachea branches at about midchest into the left and right main bronchi (brong ‘-ki; singular, bronchus). Each main bronchus enters its respective lung, where it branches to form smaller lobar bronchi, one for each lobe of the lung. Lobar bronchi branch to form segmental bronchi that lead to different bronchopulmonary segments of each lung lobe. The bronchi continue to branch into smaller and smaller bronchi. Because the bronchi resemble tree branches, they are collectively called the bronchial tree. The walls of the bronchi contain cartilaginous rings similar to those of the trachea, but as the branches get progressively smaller, the amount of cartilage gradually decreases and finally is absent in the very small tubes called the bronchioles (brong’-ke-ols). As the amount of cartilage decreases, the amount of smooth muscle increases. The smooth muscle plays an important role in regulating the airflow through the air passageways. Contraction of the smooth muscle causes bronchoconstriction, which decreases airflow. Relaxation of the smooth muscle results in bronchiodilation, which increases airflow. Air passageways larger than bronchioles are lined with ciliated mucosae that continue to trap and remove airborne particles. Bronchioles are lined with mucosae containing simple cuboidal epithelium, so foreign particles that reach them are not effectively removed. 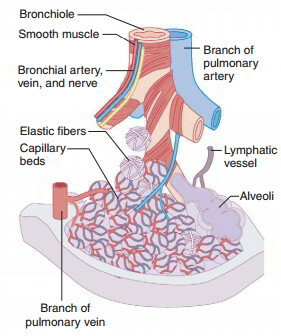 Bronchioles branch to form smaller and smaller bronchioles that lead to microscopic alveolar ducts, which terminate in tiny air sacs called alveoli (al-ve ‘-o-li; singular, alveolus). Alveoli resemble tiny grapes clustered about an alveolar duct and are composed of simple squamous epithelium. The primary function of the bronchial tree and bronchioles is to carry air into and out of the alveoli during breathing. The exchange of respiratory gases occurs between the air in the alveoli and the blood in the capillary networks that surround the alveoli. Oxygen and carbon dioxide diffuse readily through the thin respiratory membrane, which is composed of squamous cells of the alveolar wall and the capillary wall. Alveoli are extremely numerous-about 300 million in each lung. They have a combined surface area of about 75 square meters and can hold about 6,000 ml of air. Alveoli contain very small spaces, which are coated with a watery fluid. The attraction (surface tension) between water molecules would cause the alveoli to collapse if it were not for surfactant. Surfactant (ser-fak’- tant) is a mixture of lipoproteins secreted by special cells in alveoli. It reduces the attraction between water molecules and keeps alveoli open so they may fill with air during inspiration. Without surfactant, alveoli would collapse and become very difficult to reinflate. The paired lungs are large organs that occupy much of the thoracic cavity. They are roughly cone-shaped and are separated from each other by the mediastinum. Each lung is divided into lobes. The left lung has two lobes (superior and inferior) and is somewhat smaller than the right lung, which is composed of three lobes (superior, middle, and inferior). Each lobe is supplied by a lobar bronchus, blood and lymphatic vessels, and nerves. The lungs consist primarily of air passages, alveoli, blood and lymphatic vessels, nerves, and connective tissues, giving the lungs a soft, spongy texture. Two layers of serosae, called pleural membranes, enclose and protect each lung. The visceral pleura is firmly attached to the surface of each lung, and the parietal pleura lines the internal wall of the thoracic cage. The potential space between the visceral and parietal pleurae is known as the pleural cavity. A thin film of pleural fluid occupies the pleural cavity and reduces friction between the pleurae as the lungs inflate and deflate during breathing. Although lungs are elastic and tend to recoil, the attraction of water molecules in the pleural fluid within the pleural cavity keeps the visceral and parietal pleurae stuck together.